Deadlines are deadlines, and schedules tend to be unforgiving, particularly on short runs, or small orders. 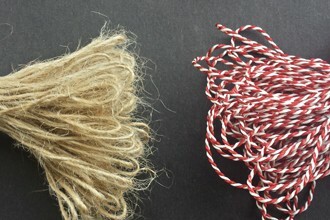 When there is not enough time to send a job to us for stringing, knotted loops are also available. This is a very popular option for last-minute emergencies, which is so often the case. We produce knotted loops by running our stringing machines without loading tags into the machines. When time does not permit for stringing a short run of tags, these knotted loops prove very useful to some of our clientele. We can run knotted loops a bit faster than we can run tags through a machine, quickly yielding large quantities. This can be useful with a tight deadline, or if a production line requires an emergency partial order. In many cases, we would ship these knotted loops to the location where the tags are produced, or to where the tags are applied to a product. Production staff at that location, such as a bottling plant or other distribution facility, would then apply the loops to the tags. Loops also frequently find use in hand-application processes for distinctive tags with holes of unusual shape or size. In addition, loops can also be used in multiple-tag assemblies or other hand assembly projects. We can ship you bundles of pre-knotted loops that you can loop through pre-drilled or pre-punched tags for that last-minute production run. We can also do the looping for you. Check out our Hand Assembly page for more information. 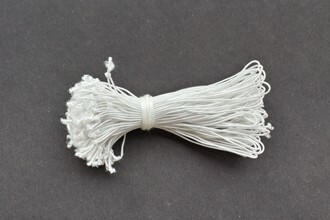 We offer knotted loops of any kind of string we use for normal stringing operations. 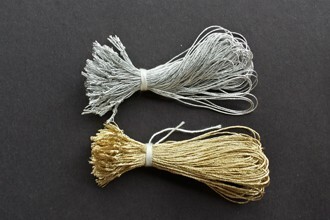 You can check out all of our string options on our String page. Feel free to browse our selections, or contact us to request a sample. The trimming of "tails" is a frequently selected option for metallic lamé loops, among other strings. "Tails" denotes an industry term for the portion of the loop past the knot. Our machines do not control the length or appearance of the tails. As such, our staff can trim loops by hand, yielding a neater appearance.